Current forensic carers were significantly less likely to accept support and engagement offered than their generic counterparts… only one patient’s carers had ever attended a CPA review. There has been times recently with new consultants who do not contact relatives when patients are admitted so families may not know where their son is etc. and that is difficult for us as nurses to deal with as it could only be a ‘your son is safe’ phone call but also a lot of useful, essential information can be gathered re: someone’s illness from such a call. One community service reported initial difficulties with staff commitment to the carers group because of a dislike of working evenings. To counter this, the group was staffed via a rota, but this perhaps diluted continuity of staff involvement. This problem was solved by a particular member of staff finding they enjoyed the work so much that they volunteered to staff the group permanently. This speaks of the potential for staff involvement in carer support to maximise job fulfilment, but might suggest some potential service vulnerability to staff illness or turnover. It also indicates that the service did not see carer involvement as part of its core work. One fifth of services stated that they did not systematically monitor or evaluate the support offered to carers. While not systematic, the most commonly cited mechanism used was to ‘obtain direct feedback from carers’, followed by questionnaire surveys. The State Hospital conduct an annual survey of this kind. The average percentage of carers reported to be using support across all types of forensic mental health services was 43%, with a range from zero engagement to 100%. Particularly high estimations came from one of the State Hospital hubs, who reported 100% involvement of carers through the Visitors Centre, and respondents from low secure for learning disability services. Those estimating low uptake included all the medium secure units, one of the private units, an IPCU, a community forensic team and a day centre. Table 6 below shows that most respondents estimated uptake to be in the low to medium categories. 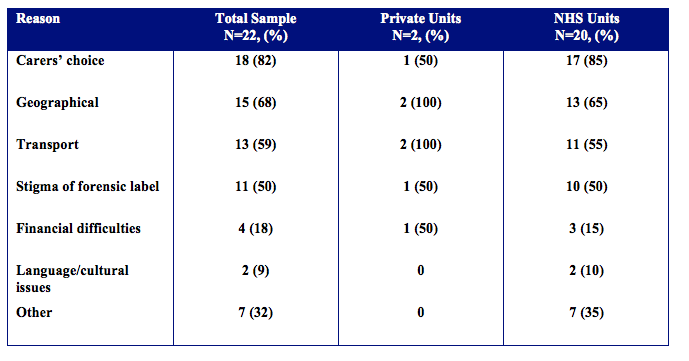 Table 7 below shows that the main reasons why staff in forensic mental health services believed that carers did not take up the available support were predominantly about carers’ own choices and circumstances, or with the stigma associated with caring for a relative in forensic mental health services. In this regard, the carer’s choice was rated as the most likely reason by four out of five of respondents, followed next by geographical challenges, and, related to this, transport, and then stigma of the forensic label. Both independent hospitals cited geography and travel as the key reasons. Most comments from the survey indicated that staff opinions about carers and their engagement were coloured by their views of carers not maintaining contact with their relatives, whereas the findings in the next two chapters show that many forensic carers clearly do stay in contact but experience a number of barriers to accessing support. Language or cultural differences were the least cited reasons as to why carers do not use available support. Almost a third of all service respondents gave ‘other’ reasons for carers not using the support provided. These included carers not having time, carers appreciating having less responsibility when their relative was in hospital, previous negative experiences, carers not believing their relative has a mental health problem, or the carer not having a relationship with the patient. Although the majority (81%) of respondents reported having a confidentiality policy, just three forwarded these to the research team. Three respondents in NHS services did not know if the service had a confidentiality policy.